Born as a collaboration of Stanford University and the University of Michigan, with funding by the National Science Foundation, National Election Survey (ANES) conducts national surveys of the American electorate in presidential and midterm election years and carries out research and development work through pilot studies in odd-numbered years, as well as presenting other major data collections including ad hoc stand alone studies. The mission of the ANES is to inform explanations of election outcomes by providing data that support rich hypothesis testing, maximize methodological excellence, measure many variables, and promote comparisons across people, contexts, and time. Now encompassing 30 biennial election studies spanning six decades, the Time-Series Studies are conducted both before and after the election and each study addresses a wide range of substantive themes including: expectations about the election outcome; perceptions and evaluations of the major parties and their candidates; interest in the campaign; information about politics; partisanship and so on. 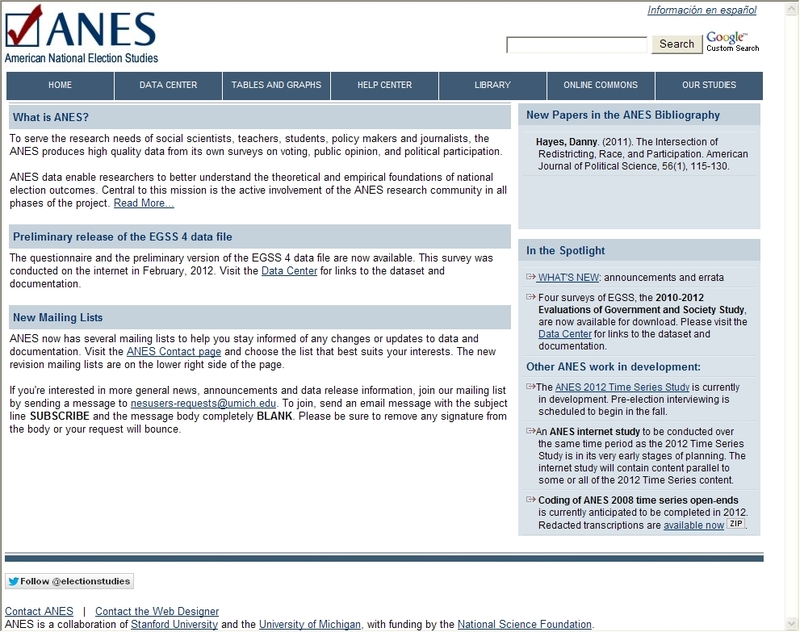 As part of its public mission, the ANES website provides open and free access to its data and documents allowing different options for accessing its material. Some content is also available in Spanish, while overall the website appears a bit too static and unwelcoming.